Female travel bloggers now abound on the Internet, but Evelyn Hannon was a pioneer. In 1997 at age 57, she launched journeywoman.com, an online travel resource just for women. Before then few people acknowledged a simple fact: Women have different travel concerns from men when traveling solo. Journeywoman first appeared in print in a mini-magazine Hannon started in 1994, but the real genesis of the site came in 1982. Hannon and her husband recently had been divorced. They had fallen in love at 14, married at 19 -- “Way too young,” she says now – and had two children. At 42, they knew they were going in different directions and had agreed to an amicable parting. They would remain friends, but the pain of breaking that tie was “incredibly distressing,” says Hannon. “I felt that I had to go into the world by myself.” She took a trip to Europe – alone. That solo journey would be the seed that would grow into Hannon’s late-blooming career as a travel writer and Journeywoman. As a writer, Hannon has had plenty of life experiences to tap into. During her marriage, she founded and operated a children's camp, worked at a recreational center for older adults and launched a company called Sorties that took older adults on trips to North America. After her divorce, she went back to school to study film and television. At 49, she got a grant to go to China to do research for a film on the way women do traditional Chinese medicine. In her fifties, she moved to Toronto where she started journeywoman.com. On her 65th birthday, she celebrated by running in a 10K race. Now 73, Hannon isn’t ready to slow down yet. Dubbed the Grandmother of Women's Travel (and now a real grandmother of four), she still manages (with only the help of a webmistress) her far-reaching network of female travelers (the website gets one million visitors a year) who keep each other informed and sometimes even meet up with each other in various parts of the globe. The site is peppered with good advice and articles written by contributors about their experiences. Hannon writes about her own travel adventures like the time she traveled to China with her daughter Leslie when she adopted a Chinese baby named Lotus. Hannon tweets several times a day to her more than 22,000 followers on Twitter and writes a weekly blog – “Aging Disgracefully” – that appears on YummyMummyClub.ca, a website founded by her other daughter, Erica. Creativity and travel have a lot in common. Both involve a certain amount of risk and putting yourself out there. How has aging changed your approach to your creative life as a travel writer and your actual traveling? As I get older, I get bolder. At this point I’m 73 years old and I pretty well speak my mind. I’m not afraid anymore. I’m not afraid to approach people. I’m not afraid to be playful. You know that whole thing about “when I get older, I’ll wear a purple hat.” Things don’t embarrass you and you know that you have the expertise and people know you are not just fooling around. You talk with admiration about your mother as someone who knew how to grow old gracefully. But your blog is called Aging Disgracefully. That’s right. My mother was an absolutely lady. I am a maverick. I don’t think anybody can accuse me of not being a lady. I’m never rude. I’m friendly. But my mother was a very sophisticated lady. I am a funky lady. I’m aging disgracefully -- doing it a little differently than people expect. You started Journeywoman at age 57. What are the advantages to starting a project later in life and what are the disadvantages? I don’t think there are any disadvantages at all. The career moves that I had had in place before I started this company all gave me terrific background and access in order to create the new one. So I was bringing forward all this lovely experience. I was saavy enough at that point. I had business acumen. Yeah, it was perfect. I think that your excitement when you’re older is so much more because you understand that you are taking this on because you really really love the idea. What was your first travel piece about? In your piece Girl With a Grandmother Face, you describe your grandchildren’s negative reactions to your wrinkles. To counter that, because they called you old and weak, you challenged them to an arm wrestling match, which, of course, you eventually let them win. What can we do to change our society’s negative views of “girls with grandmother faces”? Or it up to us? Do we need to change attitudes out there or do we need to change attitudes within ourselves? The concept of aging and of grandmother sitting in her rocking chair and knitting and all of the stereotypes are still in books. But our generation is slowly changing that. We’re living longer. We’re healthier. Many, many of us are single and therefore are working longer and choosing to work longer because it’s our way of being out in the world. I think we’re changing attitudes without really understanding that it’s happening. There are too many of us not to be changing the concept. Just by what we’re doing. I don’t think there’s a fight. When I meet up with younger travel bloggers, everyone is excited to see Journeywoman because I was the first one to start travel writing from a woman’s point of view. But when kids who are 40 years younger than I am say they cannot believe that I am 73 years old, I say, “Why? Age doesn’t have to do with your face. It has to do with what’s going on in your heart. It has to do with your spirit.” I think there are way more of us with that gumption, with that spirit than ever before. 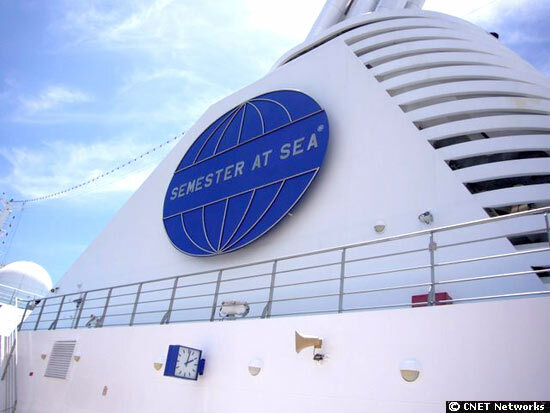 At 68 you joined 750 students and a dozen 50 plus lifelong learners for a 108 day voyage around the world with Semester at Sea. What did the younger students teach the elders on that trip? The energy. The excitement. The creativity. The crackling in the air because they were always so curious and wanting to change the world: It just invigorates you to be around that kind of energy. That’s what they taught me: Just get out there and try. Some of the older people tried skydiving because all the other kids were doing it. What did the younger students learn from you? I was only supposed to be on that trip for half the time. I had done some mentoring on board and given a few lectures. But when the kids learned I was getting off – six weeks into the journey -- they told me that they didn’t want me to go. “My cabin is being taken over by someone else,” I told them. “That was the contract.” Then one young woman, a medical student, came to me and said, “I’m not letting you go. I have a cabin with an extra bed and I want you to stay with me.” “It’s such a delight to have this invitation,” I told her, “but it’s going to be like having your grandmother in your room. Why don’t I just stay for one more port.” She said, “If you don’t stay for the whole trip, I’m not inviting you.” So I stayed. Oh, the fun we had. They just took me in. Nobody cared how old I was. I have noticed that the eligible ages for senior discounts vary wildly – ranging from 55 years on up to 70. Is that an example of society’s unwillingness to deal with age or is it a good thing that we don’t have a set idea of when old age begins? We have young…why shouldn’t we have old? But old has so many layers. It’s like the Eskimos who have many names for snow. There are so many interpretations of what old is. I think we can say what retirement age is – as long as it’s not mandatory. We can give people the option of stopping their profession at a certain time and collecting their pension, if they choose to. But in terms of society deciding what’s old is. No. What is the age of your oldest contributor? I don’t know. So many of them are just a name. They send in their tips from all around the world. We have a deal. I don’t charge anything for my newsletters, but everybody who receives them needs to be prepared to send me one tip a year. That’s all I ask. And it’s amazing. This network is like the Little Engine That Could. And they just keep sending in their stuff. Have you ever thought about writing a travel memoir? I can’t wait to put my story down on paper. But I’m waiting until I retire. I am so busy. I wake up at 5 a.m. and I force myself to stay in bed until 7 but for those two hours my mind is racing about everything that needs to be done. Because it really is more work than one person should be handling. I’m also blogging. I’m the resident grandmother on my daughter’s website, which incidentally just won a Digi award, the Oscar of the digital world. Then trying to be a good grandmother. And people are always calling me to ask me to give a post on this or that. I finally have gotten to the point of saying, if it’s a paid position, yes I will do it. But I can no longer do it complimentary. It’s too much for me. Wife, mother, business woman, divorcee, solo traveler, filmmaker, grandmother, travel writer, Internet personality, teacher, blogger, tweeter, Journeywoman: Evelyn, who are you? Every seven years, I kind of change. You know what drives me? I take on things that I know nothing about. I’m an absolute novice. I work at it until I perfect it in some way and get some recognition or an award or whatever and then I close the door and I say, okay I know how to do that. Life is short. I want to learn how to do something else. So are you due for another reinvention? No. Journeywoman, it’s my love. I found my love. What an inspiring story, Margo! Can't wait to check out Journey Woman. disgrace" I aspire to. Brava!